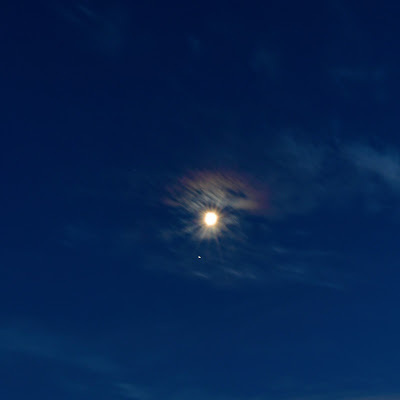 The Moon with a rainbow halo in cirrus clouds (with the Jupiter beneath). My dear wife Martina seems to be under the spell of the moon, or more precisely I should say her work is. As many of you know, she is an Internist at a hospital in the Bronx and she often complains about being on call during full moons. Frankly, it defies any attempt for quantified systemization: sometimes it is about a higher number of patients, other times patients are fewer, but more complicated and yet at other times it is not about patients at all, but about their difficult relatives. Whatever the reason, around the full moon I know that I or our son Jakob can prepare dinner at least an hour or two later than usual. Many professionals in hospitals are convinced about the influence of moon over their work and they are not alone. Some police departments are on record for scheduling extra officers for the full moon nights. This Sunday we will leave all the sinister aspects of the Moon out and instead of lunacy we will concentrate on positive and beneficial aspects of the Moon. We will look how the Moon fits positively into our Christian faith.